……. 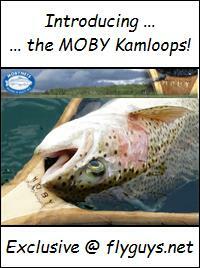 another informative fly fishing article by Ron Newman. This one on strategies for fly line selection trolling flies! The most basic of fly fishing techniques is to drag a fly (trolling flies) behind your watercraft. The hard-nosed purest will say that this is trolling rather than fly fishing. Well, yes, it is trolling. But it is also fly fishing without participating in the casting portion of the sport. Dragging a fly (trolling flies) is a very effective technique for locating and catching our Rainbow Trout. For some folks, this is the main or only way they fly fish. 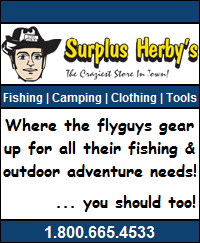 Even the average member of the Kamloops Fly Fishing club drags a fly about 15% of the time (from the March 2011 KFF Questionnaire). However, for the KFF members, the trolling flies technique is generally used as a strategy to locate fish prior to dropping an anchor and casting. When there are no signs of fish activity and we are fishing an unfamiliar lake, or even when the usual hot spots aren’t producing on a familiar lake, we often resort to dragging a fly to find out where the fish are feeding. In essence, we are quickly trying a bunch of locations in a short period of time. This strategy also allows us to try numerous flies at different depths moved at different speeds through these locations. When we have a strike, the strategy is to drag through the same area again to see if it was a fluke or if there are more fish in that location that are interested in that particular presentation. If so, it is time to drop an anchor and repeat the presentation while casting. With respect to fly line selection, the technique of trolling flies can be practiced with any fly line you own. The intermediate (slow) sink line is probably the most popular followed by the various faster sinking lines. However, the dry line and sinking tip lines can also be very effective even though folks don’t often think about using these. When casting, we select our fly line based on what it will do in relation to the type of fly, retrieve and water (depth) we are fishing. Those same line attributes should be considered in fly line selection for trolling flies as well. Let’s have a quick look at each type of line in relation to dragging a fly. 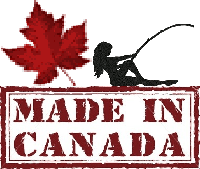 The dry or floating fly line doesn’t sink and usually keeps a fly on or near the lake surface. This line is excellent for dragging over shallow shoals and weed beds, especially in the spring and fall or when the fish are moving at or near the lake surface. The dry line needs to be dragged very slowly to prevent a fly from rising to and skimming over the lake surface (unless that is the intent of course). Most motors, even electric, will move the watercraft too fast, especially when going with the wind. Slowly moving with oars or wind drifting will often produce the best results. I would also suggest weighted flies or a little weight on your leader. And don’t worry about hanging up. Even the slightest movement will usually keep the fly above the weedy bottom. The dry line can even be used to drag dry flies. When the Caddis are out and traveling, try a very buoyant dry fly such as a Muddler to determine if the fish are interested. I have even picked up fish in the middle of the lake with this approach. The sinking tip lines are best when dragged at slow to very slow speeds. They can be used in fairly shallow water or when you suspect the trout to be feeding just under the surface. You can even stop movement to let the line settle closer to the bottom along the drop-offs to test for trout there. This line is probably as versatile as, and maybe even more versatile than the intermediate (slow) sink lines for searching out fish locations, feeding depths and choice of flies. However, I seldom see folks using this technique. The next time you need to “search out” the fish, consider using your Sink-Tip line instead of automatically putting on the intermediate sinking line. This line is usually the first choice of folks who are trying to locate trout by dragging. It is a good line for dragging along most shoals and drop-offs, at a variety of speeds, and at any time of the year. At very slow drag speeds, you can probably get the line down to depths of 17 or 18 feet or increase speed to bring it nearer the surface. Without needing to go too fast, you can fish shoals as shallow as about five or six feet and use almost any type of fly. All these factors are what make the intermediate sinking line an excellent choice when searching for the fish. The faster sinking lines will put the fly deeper into the water column even when dragged at higher speeds. It is a good line for searching out fish during the hot summer months, especially when fish are not showing at the surface. It allows the angler to place the chosen fly into or below the thermocline over the drop-offs or in deep water. It isn’t, however, a very good choice for using at slow speeds in shallow water. So the next time you are trying to locate fish by trolling flies, give a little consideration to fly line selection. On occasion, it may be wise to select something other than the intermediate sink. 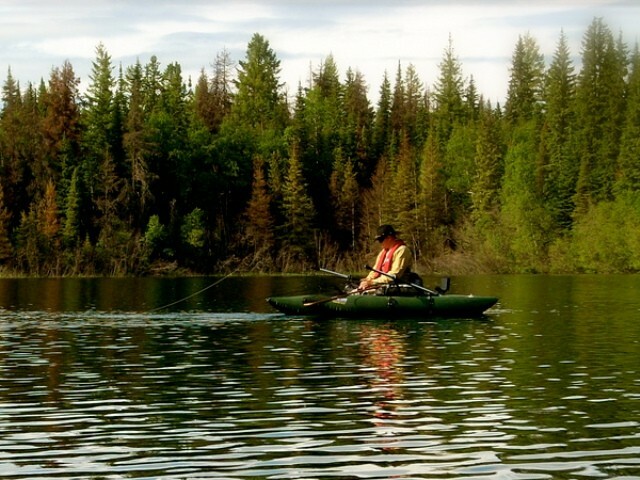 This entry was posted in Still Water Fly Fishing and tagged dragging the fly, fly fishing techniques, fly line selection, full sinking level trolling, Ron Newman, setup for trolling fly on bc lakes, sinking fly line for trolling, trolling, trolling flies, trolling floating line for trout, trolling fly line, Trolling Sinking Fly Line, Trolling the Fly, trolling with fly line, trolling with fly rod and sinking fly line. Bookmark the permalink. Good article Ron, I must confess that I like to troll a VI sink tip with my Cactus muddler in my tube and have had good success doing it. Not only off and on shoal/drop-off but also mid lake. Same here Gord. When trying to locate fish or when anchoring just isn’t working I always seem to go to my fast sink tip with a leech and it rarely lets me down! Yes, trolling is an effective way to fish a fly and to find fish in a lake, and there is of course nothing wrong with trolling, some of my best friend’s are trollers…but the fly fishing doesn’t start till you start casting. If I have to come down there and get in between you two I will! Wait a minute I’ll be there Friday. First and last warning.